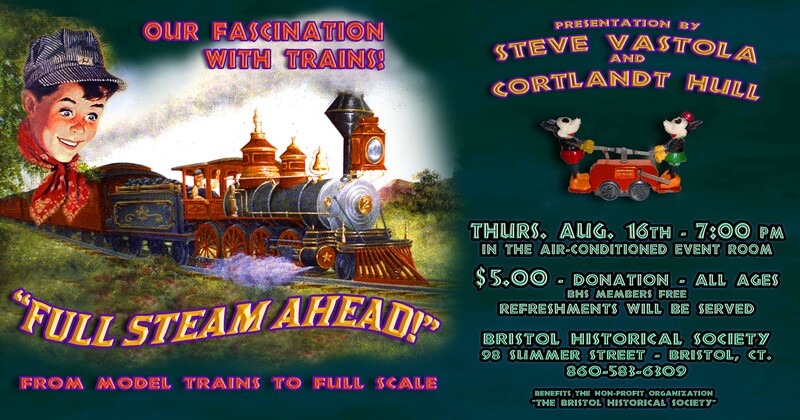 “FULL STEAM AHEAD” is a program on the history of full size as well as model trains presented by STEVE VASTOLA & CORTLANDT HULL. There will be a large display of rare vintage model trains in all our display cases, from the 1930’s to the present, from various makers including Lionel. These are larger model trains – o-gauge and standard gauge, from the late Bristol collector and WWII veteran, Louis Gagnon, some models he hand tooled from scratch, all highly detailed. The public is welcome to bring cameras. The presentation will discuss both model trains and full scale working trains from CT. and surrounding areas. at The Bristol Historical Society, 98 Summer Street, Bristol, CT.